Happy Saturday, everyone! I hope you all had a wonderful Thanksgiving. Sometimes in the rush to get ready for Christmas, this holiday gets neglected, but I love this opportunity to reflect on all we have to be thankful for and getting together with family and friends to enjoy a fabulous meal! I am so thankful for all of you that take the time to visit Golden Inkspirations and leave just a little love behind...your kind comments are so much appreciated! That being said, it's time once again for The Sweet Stop sketch and this one is just perfect for showing off those large scenic stamps. 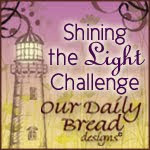 Creative Nugget: I just love this new window die from Our Daily Bread Designs. The detail is fabulous and it works so well with many of the stamps you already have! 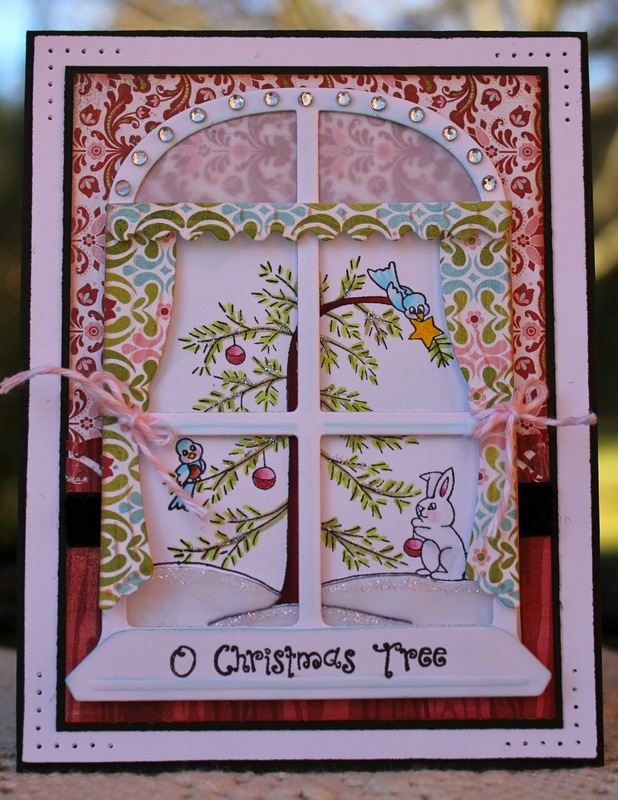 I decided to pair the window with a cute little stamp from Sweet 'n Sassy Stamps called "O Christmas Tree," which is not available right now in the store. The window and curtain dies were cut and shaded with my copic markers. A piece of vellum was attached behind the top part of the window which was decorated with rhinestones. Little twine tie-backs were added to the curtains...fun, and the windowsill was cut again for the popped up sentiment. Then it was time to work on the scene behind the window. A piece of Select White card stock was cut to fit the window. The Christmas tree scene was stamped so the image would be centered in the window, and colored with copic markers. The snow mounds were stamped again onto vellum, cut out, and adhered over the main image. Then Star Dust Stickles was added to the snow and the branches to give it some sparkle. The window was then popped up on top of the wintery scene and adhered to the card front which was made to look like a room complete with Eskimo Kisses DP and a black velvet ribbon chair rail. Some piercing was added to the corners before attaching the whole card to a True Black card base. I deviated a little from the sketch as there seemed to be no perfect place for the little circle text element. I had so much fun designing this card...I know I will be using this window die again and again! The Sugar Babies have once again come through with fabulous samples to spark your creativity. Be sure to check them out and join the fun over at The Sweet Stop by uploading your card! Thanks for stopping by for a visit...have a wonderful weekend! Happy Saturday to you, my friends! Have you noticed that little nip in the air? I do believe winter is on the way! Thoughts of snow and snowmen are on my mind, and so I reached for this cute little SNSS set called "Welcome Jesus" for my Sweet Stop sample for this week. 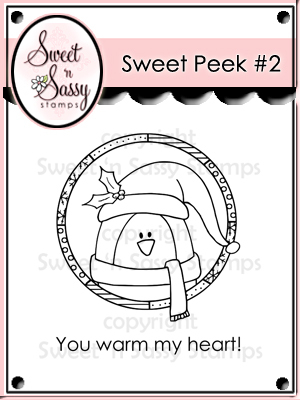 The main image in the set is this adorable joyful snowman! Creative Nugget: I began by stamping and coloring the snowman on a rectangle nestie with my trusty copics. The sparkly starburst shapes and snowdrifts were added. A second snowman was stamped on a scrap piece of paper, cut out, and popped up on top of the the first one. Eskimo Kisses DP was used for the background panels. I actually got my Sew Mini out for some real zig-zag stitching around the edges of each panel. A Martha Stewart snowflake border in Cherry Cobbler was added to the turquoise layer which was given some texture with the canvas impression plate. This was all added to a Cherry Cobbler layer and then to a Select White card base. A build-a-flake die, Maraschino Baker's Twine, and Star Dust Stickles were added to complete the card. Now...doesn't this card just make you think of winter? 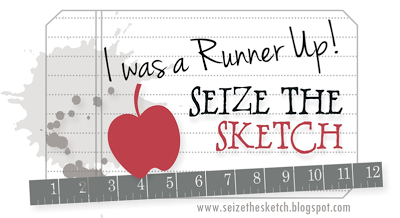 This was such a fun and easy sketch to use...I know I will be using it again! Check the other marvelous creations by the Sugar Babies and give this one a try. Upload your creation using the keyword SSS135 over at The Sweet Stop. There's one more week left in November's SWEET CELEBRATION which means you can be randomly selected to win a $10 prize for SNSS! We love to see your talent displayed each week! Thanks for stopping by for a visit! Bundle up out there...and have a wonderful weekend! When I realized Thanksgiving is less than a week away, I knew what I wanted to do for my SNSS Blog post for today! Every year my DH and I get invited to Thanksgiving dinner, and every year I make a table favor for everyone, so it was time for me to come up with this year's idea! Korin had just added a new "Save the Turkeys" digi to the SNSS Store that would be just perfect. I started playing around with the Spellbinders Label 10 die because the ends reminded me of turkey feathers...okay...maybe that's a stretch, but bear with me! This is what I came up with...AND...6 Hershey Nuggets or little cello bags of mixed nuts fit perfectly in this little favor box! Here's how to make this cute little turkey box! Step 1: Die cut the largest Label 10 die from card stock. Now would be a good time to add texture if you want. Center the die between the left end and the 6" mark on a Scor-Pal and score at 2 and 4 inches. (Or use whatever scoring tool you have.) Then turn the die vertically and score at the ends of the scallops on each side. Cut the tabs up to the score line as shown. Step 2: Apply adhesive to the tabs on the right side of the die cut. Step 3: Fold on all the score lines. Tuck the tabs in and adhere. At this point you can decorate your box...or...make a liner. Step 4: Cut a complimentary piece of card stock 4 1/2" X 4 1/2". Score at 1 1/4" on all four sides. Cut corner tabs to score line and add adhesive to the tabs on the right side of the box. Step 5: This is what you end up with. This liner will tuck perfectly into the little die cut box. I added some adhesive to the bottom to hold it in place. Step 6: I decorated my box by cutting a piece of DP with the next size smaller die and wrapped it around the box. The great thing about digi images is that I was able to size the turkey to fit the box perfectly! The "Save the Turkey" image was colored with copic markers, cut out, and popped up on the front of the box. A 6" piece of ribbon was adhered to the sides of the box and buttons were added for decoration. And there you have it! Be sure to check out all the other new digs and wonderful stamp sets at SNSS! 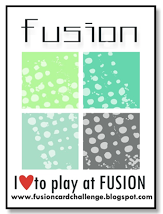 For this week, every $25 gift certificate you buy, you get a $5 gift certificate for yourself! Thanks for stopping by! I'm off to make several more of these turkey favors! Hello friends...I trust everyone has had a wonderful week! 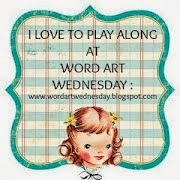 Thanks to everyone who hopped along with us on the Sweet 'n Sassy Stamps birthday celebration blog hop. Don't forget to check the SNSS Blog to see if you've won one of the fabulous prize packs...4 winners will be announced today! 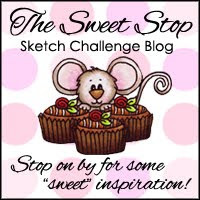 And now...since it is Saturday, it's time for The Sweet Stop sketch challenge! Creative Nugget: I apologize for the quality of the photo...the lighting was not very good when I took this picture. A few weeks ago Holly, AKA Toy, over at SCS challenged us to make a telescoping card, and there were so many beautiful samples, I thought I'd give it a try. The nativity image was stamped four times on Select White card stock and cut with different sizes of square Nestabilities. The square panels were matted on slightly larger layers of Enchanted Evening card stock. Each panel was popped up on top of each other, telescoping out from the front of the card. Here is another view so you can see the telescoping technique a little better. The base of the card is Enchanted Evening with a white panel embossed with the square lattice EF. The side panel was given some texture with the canvas impression plate and mounted on Enchanted Evening with an eyelet border. I couldn't resist adding this new Lacey Eyelet Border Die from SNSS...isn't it lovely! Some crinkle ribbon was dyed to match the card and woven through the border. Sparkly rhinestones were added to complete the card. This technique was fun and easy...hope you'll give it a try! The other Sugar Babies have outdone themselves with this sketch. 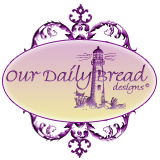 Take some time to check out what they have done...then use the sketch to create a card of your own. Use the linky tool at The Sweet Stop to upload your creation. 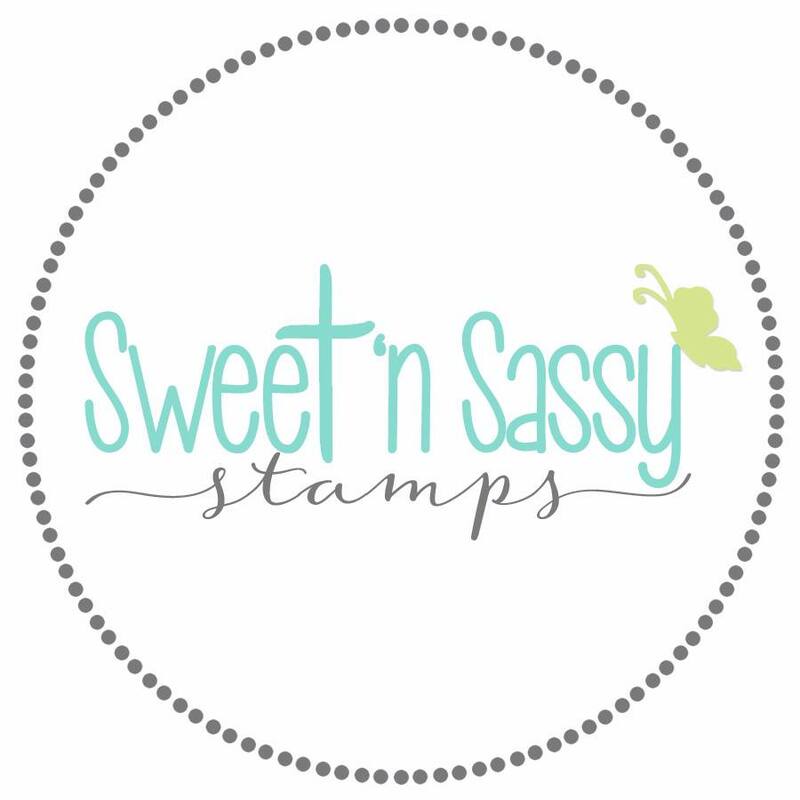 One lucky participant will win a $10 gift certificate from Sweet 'n Sassy Stamps! Thanks for taking the time to stop by today...enjoy your weekend! 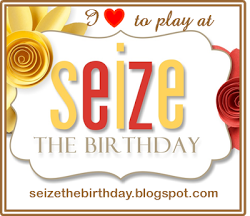 Hello friends...and welcome to the SNSS Birthday Blog Hop! 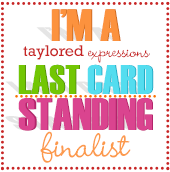 Sweet 'n Sassy Stamps is so excited to be celebrating four wonderful years! 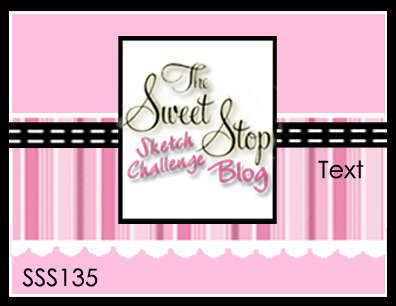 It has been my privilege to be one of The Sweet Stop Sugar Babies, and on the Design Team for Sweet 'n Sassy Stamps since August of this year! I just love working with the many talented ladies on these teams, all who are both supportive and encouraging. Korin, the owner and illustrator for SNSS, is such a sweet person who strives to honor the Lord with each stamp set she creates. If you are familiar with Sweet 'n Sassy Stamps, you know that each set of images also contains many sentiments perfect for creating cards appropriate for any season...making them very versatile! A fantastic group of SNSS design team members, past and present, along with other special friends, have put together this fabulous Birthday Blog Hop to kick off a whole month of fun! We have 37 stops so the hop will take place over three days...feel free to take your time visiting each blog! You have until 11:59EST on November 9th to leave comments on as many blogs as you can! On Sunday, November 12, SNSS will announce FOUR WINNERS who will be selected at random from all the comments that have been made at random stops along the way. Each winner will receive a prize pack that includes stamps, paper, dies, and twine valued at $40. If you have come from Darcie Bruno you are on the right track...otherwise you may want to head back to the beginning of the hop at the SNSS Blog. You won't want to miss any stops along the way! Remember to comment on as many blogs as you can...the more you comment, the greater your chance of winning one of the fabulous prize packs! Since SNSS is celebrating their 4th year, I decided to make a birthday card featuring everyone's favorite mouse...Cocoa! Creative Nugget: The SNSS image and sentiment used for my sample are from a clear stamp set called "A Cocoa Kind of Birthday." Cocoa and his yummy birthday cake were colored with copic markers. After coloring the cake, White Opal Liquid Pearls was added to the icing. The candle flame and Cocoa's eyes both got a dab of Glossy Accents. The colored image was layered on Early Espresso and Pink Pirouette card stock, and then onto panels of DP from the Sweet Tooth Collection by Bo Bunny. A MS border punch was used to make the scalloped lace down the middle of the card. A die cut number 4, pearls, a button, and twill ribbon complete the card. While I had these papers out, I decided to make a little note card for our Encouragement Ministry at church. One of the things I love about Sweet 'n Sassy Stamps are the scripture verses included with many of the stamp sets. The verse used on my sample is from the clear stamp set "Wait on the Lord." This card went together very quickly. The floral flourish was die cut from a Sizzix die and Carnation Creations by Spellbinders. Happy Birthday, Sweet 'n Sassy Stamps! Thanks for stopping by today...enjoy the rest of the hop! Hope you have had a wonderful week, my friends! What a busy week it has been! Sweet and Sassy Stamps is celebrating their 4th birthday this month with lots of special surprises, so if you get a chance...head on over to SNSS for a glimpse of all that's happening! This past Thursday, six new clear stamp sets, several digis, and three die sets were released. 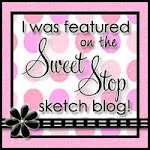 I used one of the new clear stamp sets, "God's Purpose," for my Sweet Stop sketch sample for this week! Creative Nugget: After doing a Google search for chickadee images, I colored this sweet little chickadee with copic markers. Highlights were added with a white poster-paint pen and Glossy Accents was added to the berries. The image was cut with a square nestie and mounted on a labels one die cut. Porcelain DP by Basic Grey was used for the panel pieces on the sketch. Everything was mounted on a Sweet Blush panel textured with my favorite canvas impression plate. The scripture verse stamped on the bottom, also one of my favorites, is one of five sentiments included in this stamp set. All panels were adhered to a True Black card base. Some Baker's Twine and black pearls were added to complete the card. This card will be used for the Encouragement Ministry at my church...hopefully to bring comfort to the recipient. Check out what the other talented Sugar Babies at The Sweet Stop have done this week, then head on over to SNSS. I'm sure you'll find something new to add to your wish list! Have a fabulous weekend! Thanks for stopping by..be sure to come back again on Monday for the SNSS Birthday Blog Hop! 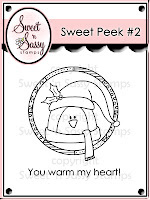 Hello everyone and welcome to the Sweet 'n Sassy Stamps Winter Release Day Blog Hop! This month we are doing something really fun...the Design Divas and the Digi Team are hopping together to celebrate the fabulous clear stamps, digis, and dies that are being released tonight!! So grab a cuppa and maybe some of that yummy chocolate the kids collected this week :) and get ready for some amazing eye candy! 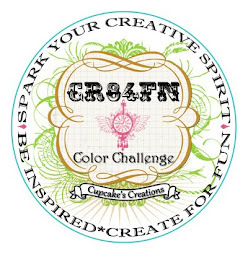 Don't forget to join us tonight at 8:00PM EST over at our member company forums at Splitcoaststampers. We have a great Release Party planned. There will be full reveals of all the new clear stamp sets, digis, and dies being released plus challenges and PRIZES! I will be sharing several projects for two of the sets being released tonight. Cozy Friends is a whimsical winter set that contains two adorable winter friends and four matching sentiments. This set is perfect for sending warm and cozy greetings to all your friends as well as for creating adorable gift tags for your Christmas packages. Here is a card made with this cute set. The two cozy friends were colored with copic markers. Liquid appliqué gives texture to the fur and a Sharpie poster paint pen was used to add a pattern to the scarves. Punched snowflakes, rhinestones, and Baker's twine finish the card. And here's a gift tag using the same set. This gift tag was made with a white and a poppy scalloped circle. The white one was scored at the top and the poppy one attached above the score line so the tag flips open. The polar bear was stamped on cryogen white card stock, cut with a circle nestie, colored with copics, and attached to the tag. You'll find that both images work perfectly with your circle Nestabilities! Some White Opal Liquid Pearls and glitter were added to the pom-pom. The Baker's twine will be used to attach the tag to a Christmas gift. And now...on to the second set! God's Purpose includes a chickadee, two scripture verses, and three sentiments. 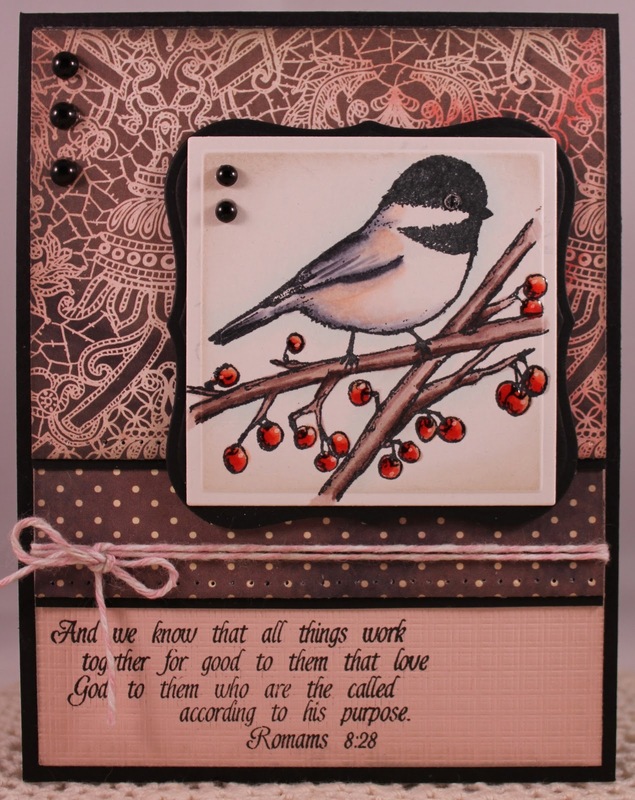 This set is another wonderful addition to the other bird sets you can find at Sweet 'n Sassy Stamps. And here is my sample for this beautiful set. The sweet chickadee was also colored with copic markers. The image is mounted on a Cheery Lynn doily die which was then adhered to a white panel impressed with a wood grain pattern. Black felt ribbon, pearls, and a layered poinsettia complete the card. I think you'll agree that both of these sets would make wonderful additions to your stamp collection! Now head on over to Margo Smith to see another amazing SNSS sample! But before you go, when you get to the end of the hop, stop back at the SNSS Blog and leave a comment to let us know what you think of the November release. You won't want to miss this step because we've got a HUGE prize up for grabs...the ENTIRE NOVEMBER RELEASE valued at over $130!!! !...that's 6 stamp sets, 3 die sets, and 11 digis! Tonight at the release party, we'll announce the randomly drawn winner from the comments made...PLUS...everyone who attends the release party will receive a free digi! Have fun hopping...Hope to see you tonight!